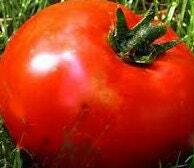 Big plants have meaty deep red blemish-free fruits of medium/large size. The flavor is rich and not quite as acidic as most red tomatoes. They’re slow to come on, but worth the wait. Instant favorite!